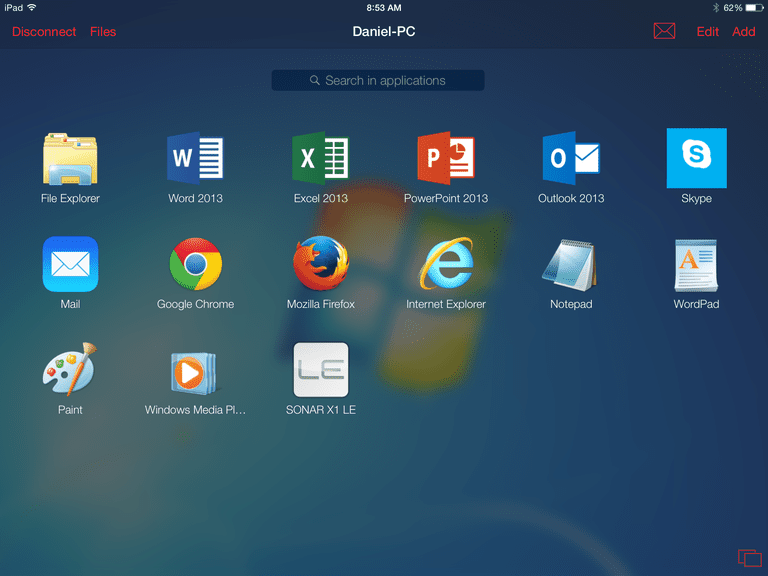 Parallels Access has its own screen for launching software on your PC. You might not believe just how easy it is to control your PC from your iPad. What seems like a very complicated process actually boils down to three relatively simple steps: installing a piece of software on your PC, downloading an app on your iPad, and telling the iPad app how to see your PC. In fact, choosing which software to use to accomplish the task may be more difficult than the actual task itself. All of the software packages that let you remotely control your PC follow those three simple steps, but for this article, we are going to focus on two packages: RealVNC and Parallels Access. RealVNC is a free solution for those using it for personal use. The free version doesn't include remote printing or some of the advanced security features, but for the basic act of controlling your PC from your iPad, it's up to the task. It also includes 128-bit AES encryption to protect your data. Like many remote-control packages, you will control the mouse button with your finger. A single tap will be a click of the mouse button, a double tap will be a double-click, and tapping two fingers will translate as clicking the right button. You will also have access to various touch gestures, such as swiping for scrolling a list or pinch-zoom for apps that support zooming. Parallels Access costs $19.99 a year (2018 prices), but if you plan on controlling your PC from your iPad on a regular basis, the cost is well worth it. Instead of simply taking control of the mouse, Parallels Access transforms your PC into what is essentially an app server. Your iPad launches apps through a special menu system, with each piece of software running in full-screen mode on your iPad. You can also interact with the apps much like they were an app, which includes tapping menus and buttons with your finger to activate them without worrying about dragging the mouse pointer over to them. Parallels Access also takes away the precision sometimes needed to control a PC from an iPad, translating near-misses on a button to a correct button press. You can also sign into your PC remotely using a 4G connection or a remote Wi-Fi. One drawback to Parallels Access is that your PC isn't quite as usable while being remotely controlled, so if you are hoping to guide someone through a task remotely by taking over the computer to 'show' them how to do it, or for any other reason you need to control the computer both directly and indirectly through the iPad, Parallels Access isn't the best solution. But for most other reasons to control a PC through an iPad, Parallels Access is the best solution available. First, you will need to register an account and download the software onto your PC. Parallels Access works on both Windows and Mac OS. Start this step by visiting this website. The website should take you to a page asking you to either Sign In or Register. Click on Register to register a new account. You can use Facebook or Google Plus to register an account or you can use your email address and set a password. Once you've registered an account, you will be presented with the option to download the package for Windows or for Mac. After the download, click on the downloaded file to install the software. Like most software you install on your PC, you will be prompted on where to install it and to agree to the terms of service. After installing, launch the software for the first time and, when prompted, type in the email address and password you used to create your account. Now that the software is on the PC, you can download the Parallels Access app from the App Store. After the download is finished, launch the app. Again, you will be asked to sign into the account you created. Once this is done, you will see any computers that are currently running the Parallels Access software. Tap the computer you want to control and a short video will show giving you a tutorial on the basics. Remember: You will always need to run the Parallels Access software on your PC before you can access it with your iPad. Before downloading the RealVNC software to your PC, you will first want to obtain a license key to use the software. Use this link to access the website and activate VNC. Be sure to choose the license type "Free license only, without premium features." Type in your name, email address and country before clicking continue to receive your key. Go ahead and copy this key to the clipboard. You'll need it later. Next, let's download the software for your PC. You can find the latest software for Windows and Mac on the RealVNC website. After the download finishes, click the file to start the install. You will be prompted for a location and to agree to the terms of service. You may also be prompted on setting an exception for your firewall. This will allow the iPad app to communicate with your PC without the firewall blocking it. You will also be prompted for the registration key obtained above. If you copied it to the clipboard, you can just paste it into the input box and hit continue. When the VNC software first launches, you will be asked to supply a password. This password will be used when connecting to the PC. Once the password is supplied, you will see a window with a "Get Started" notation. This will give you the IP address needed to connect with the software. Next, download the app from the App Store. When you launch the app, the first thing you will need to do is set up the PC you are trying to control. You do this by typing in the IP address from above and giving the PC a name such as "My PC". Once connected, you can control the mouse pointer by moving your finger around the screen. A tap on the iPad will translate to a click, a double tap to a double click and a tap with two fingers to a right click. If your entire desktop doesn't display on the screen, simply move your finger to the edge of the display to scroll across the desktop. You can also use the pinch to zoom gesture to zoom in and out.